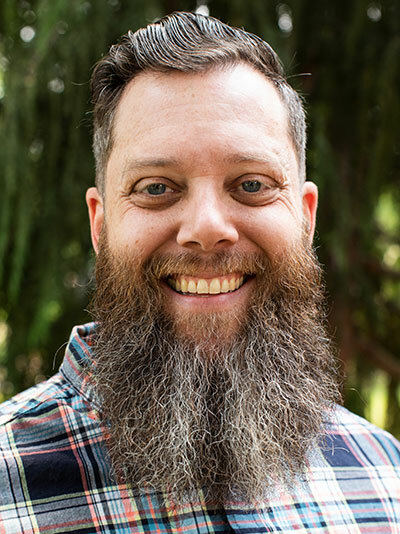 R. Anderson Campbell came to George Fox in 2011, serving first in Portland Seminary’s Doctor of Ministry department. He joined the faculty in the College of Christian Studies in the fall of 2014, and, in addition to teaching undergraduate students, also serves as a faculty and dissertation advisor for the seminary’s Leadership and Spiritual Formation Doctor of Ministry program. Anderson has an extensive ministry background, serving as a campus minister and an area director for the Coalition for Christian Outreach in both Philadelphia and Washington, D.C. He has worked in a variety of denominational contexts, as pastor to young adults and outreach in a small Presbyterian church, executive director of small groups in a non-denominational megachurch, and deacon of creative liturgy in an urban Foursquare church. He is a certified coach with Creative Results Management and has over 10 years of leadership and academic coaching experience. Anderson’s twin writing interests are creating space for voices that would otherwise go unheard and dreaming up ways for communities to more fully engage in their faith together. His first book, Father Factor (White Cloud, October 2014), is a collection of essays by 40 average men under 40 years old that explores the intersection of fatherhood and their Christian faith. Anderson’s writing has been featured in numerous places on the internet. His work has appeared at The Antioch Session, The High Calling, Faith on Campus, The Other Journal, Patheos, as well as his own blog, The Crooked Mouth. A selection of his writing is available at the George Fox Digital Commons. In addition to teaching, Anderson likes watching baseball and football. He grew up in Atlanta, and is still a big fan of the Braves and Falcons. He loves tattoos, hearing the stories behind them, and sharing the stories behind his. He is a dog lover; his family got their first dog, Finley, in 2015. Anderson is married and has two daughters. His family is a part of Theophilus Church in southeast Portland. They enjoy simple living, dinners outside with friends, and growing vegetables in their tiny garden.